Ibrox Noise often speaks on behalf of the Rangers support, not always, but often. We would never claim, unlike some, to be the universal voice for many thousands of very unique people. But we do wonder how many share our curiosity over the Stevie Gerrard back to Liverpool story of recent days. As many will know, Gerrard returned to Liverpool over the weekend to play for their Legends v Milan’s Glorie – a pitch packed with superstars as the home side won 3-2, in order to raise proceeds for the Liverpool Charity Foundation. The oddity? Seeing Steven Gerrard back in ‘Liverpool mode’. Yes, he’s an Anfield legend and that’s his team, but his intensity and focus on Rangers since May last year has honestly made us here on the site almost forget at times that he is a Liverpool fan born and bred. Whatever you make of his management performance at Ibrox, and that’s a debate for another day, on a pure football, emotional and personal level he has done so much to be Rangers for the past year that actually seeing him in what would be ecologically valid for him now seems quite strange. He’s put it in a few ways too, that while he keeps an eye on Anfield, Rangers is his day job and that’s what his focus and energy is on now. "So we’re (Liverpool) in a great place – and I say ‘we’ because I’m a fan and always will be. But I’ve got two teams in my heart now. Rangers and Liverpool." Interesting to see it's perfectly legitimate to have two teams in your heart, as 'authorised' by the manager. And therein lies the nub – Gerrard really has become one of us. 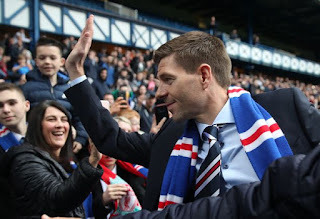 As we reiterate, regardless of how well or otherwise he does as Rangers manager, the job and the fanbase has won him over totally and he is a true Bear now. He’s defended us extremely well, he’s criticised both himself and the team where need be, and generally he’s conducted himself with the kind of dignity we’d expect from the manager. So we’ve got totally used at Ibrox to seeing him in his familiar Rangers suit, or the blue training gear – even if at first the sight of the club tie on his suit was surreal, it’s become utterly the norm. Which is why seeing him back at Anfield was so strange. Never did we think seeing Steven Gerrard involved with Liverpool FC would be odd. He's a badge rubber until he leaves for his next gig, never a true Bear, hardly a Bear light. As he said it's his day job, how many of us are serious about our day job at the end of the day, if he was offered the Liverpool Assistant Manager, he'd be off in a minute. Look what happened across at the piggery with the biggest septic fan in the world. Just saying, IMHO, don't get suckered in True Bears! You would be stupid to not believe that Gerrard is here till a better offer comes along. What that offer will be we will see in time. I doubt it would be for a Leiscester but it's an absolute guarantee for Liverpool. And I for one will wish him well. We all know he is a Liverpool man and there is nothing wrong with that. I believe he has genuinely got immersed in being a Ranger and we can have a friend and good contact for years to come. And all our players should have the same drive and ambition to be the best they can. I did see that goal he scored and thought we could do with him in our shirt. That one small passage of play showed exactly where our problems lie. Instead of looking for a pointless pass Gerrard picked the ball up, drove forward 20 yards before passing forward to the wide man. He then drove forward to take the return pass and his first thought was "how do I get a shot away" resulting in a fine goal from 20 yards. Middle to front, ball in net, all within 5 seconds. No dithering on the ball, no 5 or 6 touches, no unnecessary side or back passing. Just quick, dynamic football. Now if only he could I still that into his players.